This dish comes together very easily, but it does take a little bit of time. The time is definitely is worth it. It is a perfect comfort meal for a cold, rainy night. Heat olive oil in a large pan with a lid. Add sausage and break it up with a spoon. Once it is starting to brown, add in onion. Continue to stir occasionally until the onions are starting turn translucent. Add in garlic and stir until fragrant, approximately 30 seconds. Sprinkle flour over the mixture, and stir to combine. Keep it moving until the flour slightly brown and mostly absorbed. Pour in the white wine, and stir until it evaporated. Then mix in the can of tomatoes (including juice), tomato paste, chicken stock, bay leaf, and the Italian seasoning. Cover, and let simmer for about 30 minutes, stirring once in a while. Meanwhile, cook the pasta in salted boiling water until al dente. Drain, reserving about a cup of the pasta water. Turn off the burner under the sauce, and fish out the bay leaf. 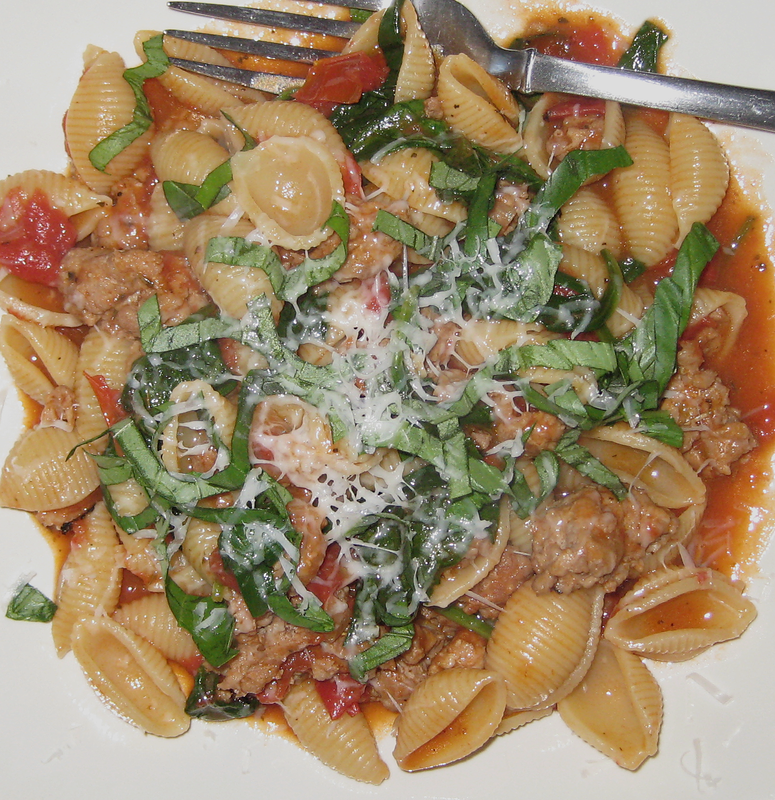 Pour the spinach on top of it, and dump the pasta on top of the sauce. Slowly start mixing it together until the spinach wilts and the pasta is completely covered with the sauce. Add in some of the reserved pasta water if you need to thin the sauce. Season with salt & pepper to taste, and top with fresh slivered basil and shredded asiago. This entry was posted in food, pork.